In 1794 a road was laid out on the Herring Farm (named for the family, not the fish) near the village of Greenwich. It separated the plots inherited by the Herring daughters Sarah, who had married Dr. Gardiner Jones, and Cornelia, the wife of Samuel Jones. The new lane was christened Cornelia Street. 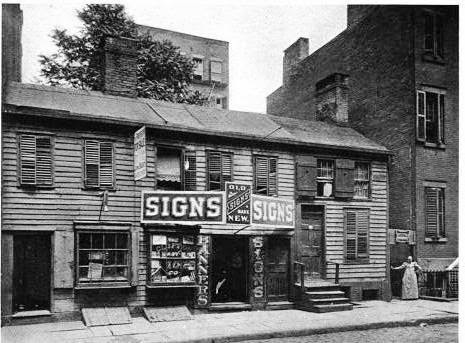 As Greenwich Village developed Dr. Gardiner Jones sold twenty building lots to Charles Oakley, “merchant,” for $8,000 on October 5, 1819—a reasonable $151,000 in today’s dollars for the rural land. 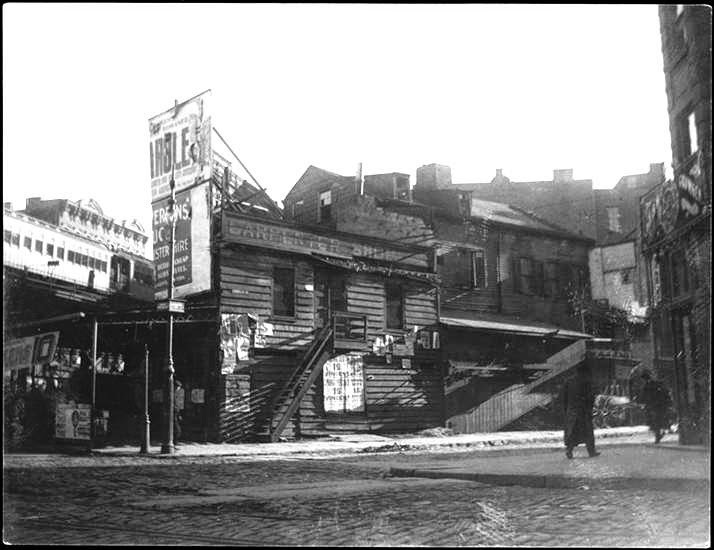 Oakley built a few structures along Cornelia Street and struggled to make a financial go of it. His small house at No. 29 was leased in quick succession in the 1830s to working class families. Henry Cooper, a carter, was here in 1834; Peter D. Demarest, another carter, a year later; and Nathaniel Voorhis, grocer, lived in the house in 1839. The turnover continued in 1841 when tailor Samuel Hirst listed his address at No. 29, and a year later when Martin Branagan, who earned his living as a baker, lived here. That year was the end of the line for Oakley’s ownership and for the wooden house at No. 29 Cornelia. According to historian William Smith Pelletreau in 1900, Oakley lost all the Cornelia Street property in foreclosure to the East River Mutual Insurance Company in 1842. Bebell divided the two lots at Nos. 27 and 29. He expanded No. 29 across the property line, creating a small house with an adjoining store, one and a half lots wide. The remaining plot became No. 29-1/2 Cornelia Street, a small store with a sleeping room for the proprietor above. In the rear were two additional wooden houses. The wide proportions of No. 29 provided housing for several residents. In 1846 Henry Demott, a carpenter, and his son John, a carman, lived here along with shoemaker George Stanley, Lewis A. Dean, a “staircaser,” and carpenter Jacob A. Cole. The Demotts and Dean were still in the house in 1849. Rather surprisingly, the unmarried Harriet Kirtland took a room in the house in 1853. She taught at Primary School No. 8 at No. 23 King Street. Her need to find cheap accommodations is explained by her salary. That year she earned $50—about $1,500 today. Next door at No. 29-1/2, James Burns ran a grocery store in 1860. He lived in what The New York Times referred to as the “sleeping apartment” on the second floor. His stock was estimated to be worth about $150 and he had insured it for $500 with the Hamilton Insurance Company. Between 5:00 and 6:00 on the morning of April 9, 1860, fire broke out below the stairs leading to his room. Even in the days before scientific forensic fire investigation, the volunteer fire fighters were quickly on to Burns’ scheme. Burns was held on $1,000 bail. He contacted Stephen H. Chase to provide his bond. Chase gave as security the property at No. 134 2nd Street, valued at $11,000. He later appeared before the court for another client, this time giving his name as Stephen H. Chapin. And once again he offered the 2nd Street property as bond. This time the ruse did not work. Had Chase checked his own story, he would have discovered the property belonged to a policeman. “It having transpired that the real estate in question belongs to Police Capt. Hart, Chase was committed for trial on a charge of perjury,” reported The New York Times on May 7. In the meantime, James Burns pleaded guilty to setting his grocery store on fire. Forty-one year old John Leahy operated the grocery store by 1876. He identified himself in city directories over the next few years as “milk,” “butcher,” and “grocer.” A widow, Mary Skelton, had moved into No. 29 that year. Within the next few months she would be joined by two other widows named Mary—Mary Wilde and Mary Wind. It is difficult to imagine the lives of the three women, with little means of support, in their meager rooms. On that Monday night, Otto came into his father’s store drunk and rowdy. “Pfeiffer ordered his unruly son to leave the place, but the youth refused, assaulted his father, and drawing a pocket knife threatened to kill him,” said the newspaper. A nearby patrolman named Taylor came to Pfeiffer’s rescue. But when he arrested Otto, he neglected to disarm him. “When the officer got his prisoner into the street the latter attacked him furiously with the knife, and in endeavoring to stab him cut his uniform coat in several places.” Otto may have regretted his aggression on the policeman. “The officer was compelled to resort to violent measures to overpower and disarm the youthful ruffian,” reported The Times. The shoe shop was once again operated as a grocery, run by M. O’Brien, on April 18, 1891 when a small fire broke out at 8:53 p.m. The blaze was quickly extinguished with little damage. Theodore Brown was living in No. 29 in 1895 when he was in an accident. Charles Gallagher introduced him to a lawyer who could handle his case. Realizing that Brown was low on funds, the4 scheming Gallagher offered him a proposition. Brown could make money as a paid witness in other cases. According to Brown later, “Gallagher asked him to act as a witness for Domenici Delli Bori, who had been struck by a Third avenue cable car at 118th street. He also asked him to secure another witness.” If he would perform this perjury, Gallagher would pay him and guarantee to have his own case settled. A year after the first perjury, in 1896, Gallagher came to Brown again “to get a witness to give testimony in the case of McNeil against the Metropolitan Street Railway Company.” Again Brown abetted Gallagher in his plot. In December 1898, when The Sun ran the headline “Ambulance Chaser Arrested,” referring to Charles Gallagher, Theodore Brown was still living in the Cornelia Street house. By now the social reform movement was underway. This section of Greenwich Village was a focal point for those who sought to rid the city of its slums and to erect healthful, safe housing for the impoverished. The derelict Cornelia Street buildings would not survive much longer. On August 24, 1900 the New-York Tribune reported that Nos. 29 and 29-1/2, along with the two- and three-story buildings in the rear, were to be sold at auction. The owner, Nathaniel Niles, owed an unbelievable $20,923.40 on the properties. In 1902 the dilapidated but quaint wooden buildings were razed. A year later the modern apartment house designed by William H. Boylan was completed. It survives, somewhat altered, today. The wretched history of charming Cornelia Street has long ago been forgotten. I live at 25-27 in the building with the yellow brick front. Thanks for this history!